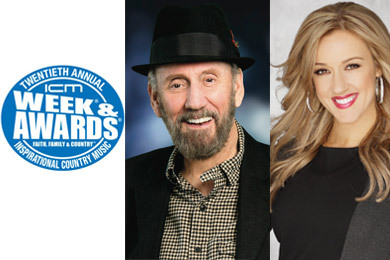 ICM Week & Awards with Ray Stevens and Megan Alexander. The Christian Country Music Association’s 20th Annual Inspirational Country Music Faith, Family and Country Week, featuring convention and nightly showcases, will run from Sunday, Nov. 9-12 and conclude with the ICM Awards ceremony at Cornerstone Nashville Church in Madison, Tenn.
Ray Stevens and Inside Edition’s Megan Alexander will host the 2014 ceremony, which features performances by Stevens and Rhonda Vincent. Doors will open at 6 p.m., prior to a pre-show at 6:30pm. The Top 5 finalists for this year’s Inspirational Faith, Family & Country Awards include Vince Gill, Guy Penrod, Lady Antebellum, Scotty McCreery, The Roys and more. Russ Murphy leads the nominations with five nods. Tommy Brandt follows with four nods. Tickets are available from $15-35. This year’s show will be broadcasted on the NRB Network as well as GEB America.